Visitor parking is limited inside the gates. But there is ample parking on either side of the road just outside the gates. 12noon - 5pm Layouts open for viewing, but no trains are running. Free admission. 11am - 3pm Layouts open for viewing, but no trains are running. Free admission. [Enlarge] We are located at 900-A Dornan Drive, Point Richmond, California, close to the east end of the San Rafael bridge (I-580) in the northeast corner of the San Francisco Bay area. Take the I-80 north and then the I-580 exit in El Cerrito heading northwest. After about 10 minutes you will see the the Canal Boulevard exit on your right. Take the exit and turn right at the stop sign. Then turn left again onto Garrard Boulevard. You will now be heading straight towards the Ferry Point Tunnel. Proceed through the intersections and go through the tunnel. The road becomes Dornan Drive on the other side of the tunnel. We are located about 1/2 mile past the tunnel on the left across from Miller/Knox Regional Shoreline Park. Take Hwy 101 north from the Golden Gate Bridge, or South to San Rafael and follow the signs to the San Rafael bridge which will put you on I-580. Cross the bridge and soon after take the Canal Boulevard exit. Turn left at the stop sign and then left again onto Garrard Boulevard. You will now be heading straight towards the Ferry Point Tunnel, pictured above. Continue, following directions next to that picture. If you are coming from the east via the I-80, take the Richmond Parkway turnout (located between Appian Way and Hilltop). Follow the "to 580" signs and stay on the Parkway. It changes names several times but take it all the way to the end. The only decision is right near the end where you have the option of taking "Castro to the 580". Stay left on the Parkway, because it now connects directly to Garrard Boulevard which runs along the side of the BNSF yard. You will now be heading straight towards the Ferry Point Tunnel, pictured above. Continue following diections next to the picture. To get to the museum via public transportation from the Bay Area or beyond, take AMTRAK or the Bay Area Rapid Transit (BART) (Richmond Line) to the Richmond AMTRAK/BART station. Then either take a TAXI, or the 72M bus towards Point Richmond (stop at Garrard Blvd/W Cutting Blvd). The bus runs every 30 minutes in the daytime weekdays and weekends. 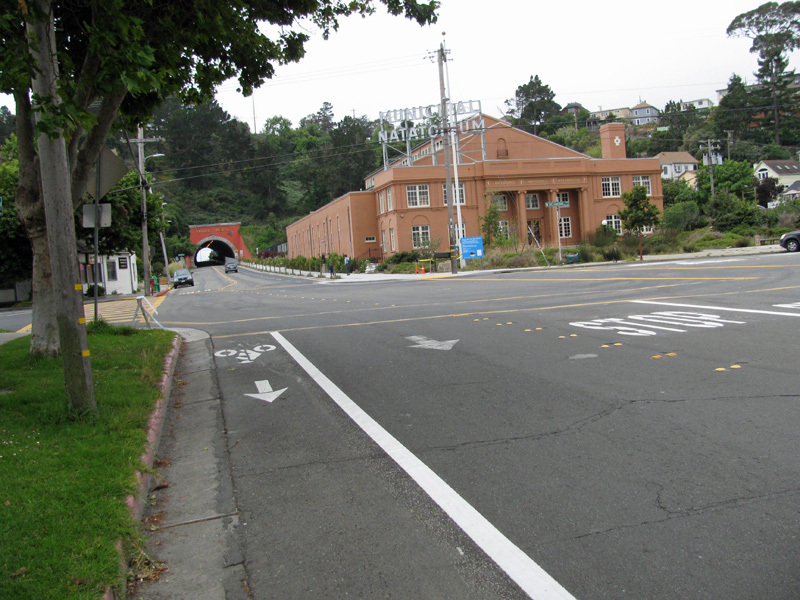 Walk south on Garrard Blvd from the corner of W Cutting Blvd in Point Richmond through the tunnel. The road becomes Dornan Drive on the other side of the tunnel. 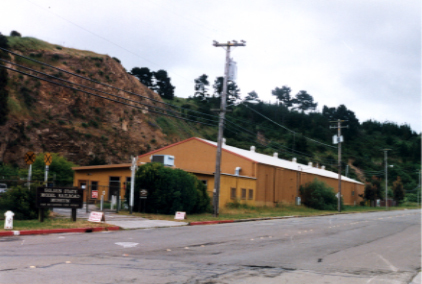 We are located about 1/2 mile past the tunnel on the left across from Miller/Knox Regional Shoreline Park. It's about a 15 minute walk. As you enter the park, you will see hills to your left and then two buildings. The first is the home of the Richmond Ramblers; we are in the second, much larger building. 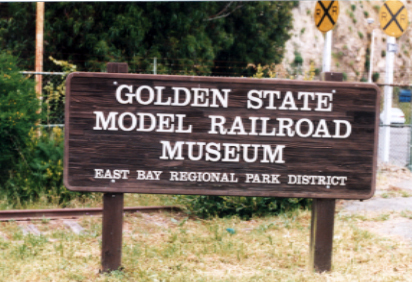 There is plenty of free parking both along Dornan Drive and in the parking lots of Miller/Knox Regional Shoreline Park right across the street from the Golden State Model Railroad Museum. The Park is a wonderful place to relax and have a picnic lunch.